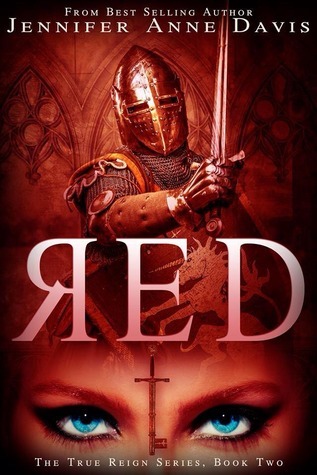 Red is the second book in the young adult True Reign series by Jennifer Anne Davis. Red is an awesome sequel to the first book in the series, The Key. I love Jennifer Anne Davis’ writing. I really do. I don’t know how she does it but she manages to bring a new – and awesome I must say – world to life in every book or series she writes. The last book in this series, War, is set to release on May 6th. Lennek wouldn’t be the one coming after her; that would require too much work. It was Darmik who would hunt her down. And he certainly had the capability to find her – hidden or not. The only hope she had was being able to defend herself, so she could get away when he came. Red starts off where The Key ended: the toe curling, heart pounding cliffhanger. Jennifer literally left me hanging at the end of book one, but she sure made up for that in the first few pages of Red. The rebel forces that were only rumors in the first book, do exist. And they aren’t going to stop fighting until the true heir is on the throne. After her rescue Rema finds herself at the rebel compound, where she is safe – for now. She makes new friends and learns to defend herself. And then Rema discovers the truth. She is the true heir. She is the one to restore the peace throughout the kingdom. But trying to take the king and his kindred down isn’t as easy as it sounds. Not when an entire army is searching for you, the king wanting you executed for treason. And besides that, Rema isn’t sure what to think and who to trust anymore. Darmik still doesn’t really know what to do. Should he stay loyal to his family, or should he save Rema? He doesn’t have much time. When an assassin arrives to retrieve her, Darmik hasn’t made up his mind yet. But he knows one thing for sure: he doesn’t want to see Rema executed. He decides to go searching for her, hoping he will find her before the assassin does. Wow. I was lost for words after reading this story. It has twists and turns all over the place. I kept turning page after page, wanting to know what would happen. The bad thing was that the book ended. I can’t wait to read the conclusion to this awesome series. War releases on May 6th.